Israeli settlers, on Wednesday, set up new mobile caravans on Palestinian-owned agricultural lands between Yaabad town and Zabda village, south of the northern occupied West Bank district of Jenin. 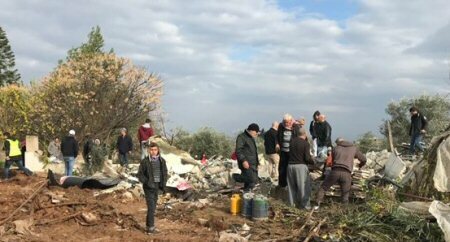 The mayor of Yaabad, Samer Abu Bakr, stated that Israeli settlers set up caravans under the heavy protection of Israeli forces on agricultural lands, of which hundreds of dunams have been seized by Israeli authorities. It is noteworthy that in August of 2018, the Jerusalem District Court ruled that if Israeli settlers built a settlement on private Palestinian land with “good intentions” then it should not be removed, therefore, allowing more Palestinian lands to be seized by Israeli settlers as they see fit. Ma’an News Agency reports that between 500,000 and 600,000 Israelis live in Jewish-only settlements across occupied East Jerusalem and the West Bank in violation of international law, with recent announcements of settlement expansion provoking condemnation from the international community.